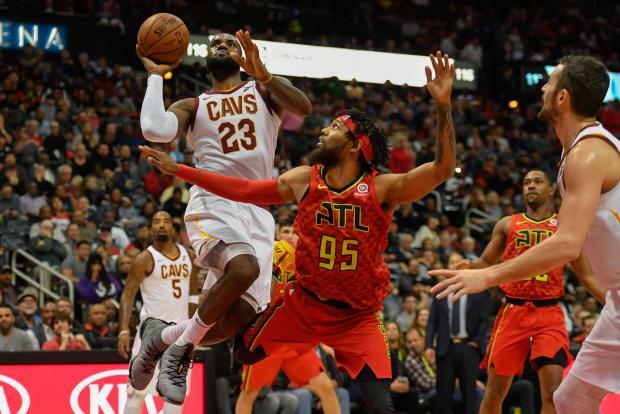 Cleveland's defense wasn't what it had been during most of its winning streak, but a season-best 18 3-pointers in 39 attempts were enough to carry the Cavaliers past the Atlanta Hawks 121-114 on Thursday for their 10th consecutive victory. Kevin Love had 25 points and 16 rebounds, and LeBron James had 24 points and 12 assists as Cleveland held on despite a scare from Atlanta. The Hawks, down by 12 points late in the third quarter, closed to 113-112 on two free throws by Ersan Ilyasova, but James hit a 3-pointer with just under two minutes left to help the Cavaliers regain control. Dennis Schroder had 27 points and Ilyasova 22 for Atlanta. Kyrie Irving scored 36 points to power Boston over undermanned but feisty Philadelphia. Irving and Marcus Morris keyed a 17-7 fourth-quarter run that broke the game open and gave the Celtics a ninth win in their last 10 home games. It was also the seventh straight TD Garden victory for Boston over the 76ers. The Celtics' Al Horford had 21 points, eight rebounds and five assists. Morris finished with 17 points off the bench, one off his season high. He scored six straight points late in the third quarter and seven more during the fourth-quarter spurt. Dario Saric led Philadelphia with 18 points and 10 rebounds. Will Barton hit a driving layup with 3.2 seconds left to finish with a career-high 37 points, and Denver overcame Nikola Jokic's ankle injury to pull out a win over Chicago. Barton scored six points in the final 45 seconds to rescue the Nuggets against the team with the worst record in the NBA. Gary Harris scored 21 for Denver. Jokic was hurt with 44 seconds left in the first half. He went to the locker room for X-rays and didn't return. Lauri Markkanen had 20 points and nine rebounds, Robin Lopez also scored 20 and Kris Dunn had 19 points for the Bulls, who lost their seventh straight game. Alec Burks scored 28 points, and Donovan Mitchell added 24 as Utah moved their win streak to four games with a victory over Los Angeles. The Jazz improved to 2-7 away from home this year, with the other victory coming at Orlando on Nov. 18. It was only the fourth time Utah defeated the Clippers in the past 23 meetings. Austin Rivers scored a season-high 25 points for Los Angeles, which saw its three-game win streak come to an end. Lou Williams scored 20 points for the Clippers, while DeAndre Jordan grabbed 16 rebounds and added eight points. Khris Middleton scored 26 points and Eric Bledsoe added 25 as Milwaukee defeated Portland. Giannis Antetokounmpo contributed 20 points, nine rebounds, five assists and three blocked shots for the Bucks. Bledsoe scored 17 points on 8-of-10 shooting to lead Milwaukee to a 60-45 halftime edge. Jusuf Nurkic collected 25 points and 11 rebounds, and Damian Lillard had 18 points, seven boards and seven assists for the Trail Blazers, who saw their three-game win streak end.